“ST. 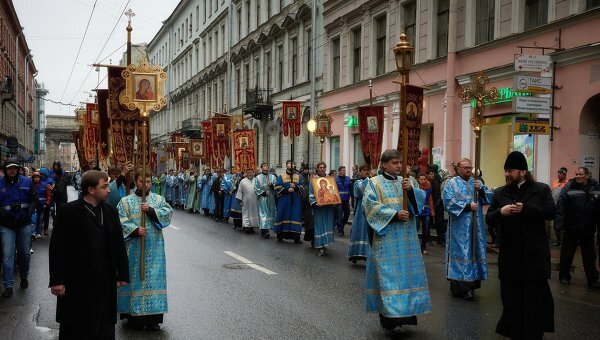 PETERSBURG, November 4 (RIA Novosti) – About 54,000 people joined a religious procession in the heart of Russia’s second largest city St. Petersburg on Monday, a city police spokesman said. “No violations of public order took place during the event,” the spokesman said. The procession began half an hour later than scheduled due to large number of believers willing to take part. It ended near the city’s biggest Orthodox church, Saint Isaac’s Cathedral, where a service was held to commemorate Russia’s National Unity Day. Those who were unable to enter watched the service on two huge TV screens flanking the cathedral. 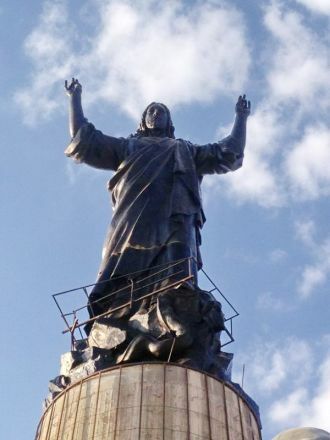 A bronze statue of Jesus Christ, taller than the famous Christ the Redeemer statue in Rio de Janeiro, has appeared in war-torn Syria. The statue, titled “I Have Come to Save the World” was apparently the brainchild of Yury Gavrilov, a 49-year-old Muscovite who runs an organization in London called the St. Paul and St. George Foundation. The project was backed by both the Russian Orthodox Church and the Russian government, which takes an active interest in Syria, as seen in recent events. Russia also has a navy base on Syria’s Mediterranean sea coast. The Cathedral of Christ the Savior was destroyed by Communists but rebuilt in Moscow by Christians and still exists today. Video from this Summer. Today is a day of sorrow and repentance. Why – we could ask – did the Lord save the Tsar [previously] on the day of Martyr Andrew and not save him on the day of the other Saint Andrew, the teacher of repentance? With deep grief we answer: the Lord could have saved him, but the Russian people did not deserve it. MOSCOW, June 28 (RIA Novosti) – Russian Prime Minister Dmitry Medvedev has signed a decree to allocate about $20 million to renovate the St. Nicholas Orthodox Cathedral in Nice, the largest Russian Orthodox Cathedral outside Russia. Remembering the Baptism of Jesus in the River Jordan. Orthodox Christians all over Russia have been celebrating the feast of Epiphany.They believe that plunging into freezing water on Epiphany cleanses them of worldly sins, and brings health benefits. Shown are Ukrainians celebrate Epiphany Cossack style; Russian Airborne Troops in Moscow; other Christians in St. Petersburg and Moscow. In Moscow, the city authorities prepared more than 56 ice holes in rivers and lakes. Prayers were held at each site to consecrate the water. A church once destroyed by the Communists now sings beautiful music to our Savior. Enjoy the beautiful scenes of Christmas eve and early morning Christmas day in Moscow at Christ the Savior Cathedral. Patriarch Kirill leads the liturgy over 6,000 people who were in attendance along with Prime Minister Dmitry Medvedev and his wife. President Vladimir Putin celebrates Christmas at Holy Trinity St George Monastery in Sochi, Russia. It is an Orthodox tradition to go to church Christmas eve and celebrate the divine liturgy past midnight through the early morning hours of Christmas day. It is a simple, beautiful serene ending after 2:30.